This time, we were at Target shopping for school supplies. Elizabeth, the 9-year-old, wanted anything pink and got a new backpack and matching lunch box. Emily, the 12-year-old, decided her old lunch box and backpack were perfectly fine and opted not to buy anything. 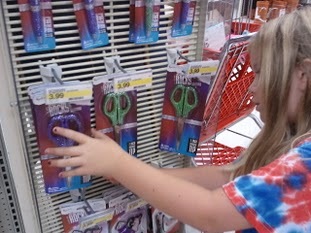 As we left, Elizabeth spotted some totally blinged-out scissors covered in colored rhinestones.